I am Thais, a first year conservation student at Northumbria University and I am now part way through a four week placement at the conservation studio in CRC (Centre for Research Collections) – Main Library of Edinburgh University. I have a bachelor degree in art during which time I developed an enormous interest in conservation. I had the opportunity to undertake various placements which helped me to decide that I wished to pursue a career in paper conservation. This led me to enroll in a course in the conservation of documents and graphic material in Brazil. I worked primarily in preventive conservation where I was always looking for further opportunities to improve my knowledge and professional skills. This has subsequently led me to the UK to study for my Masters in the Conservation of Fine Art on Paper at Northumbria University, and my current placement at the CRC. Apart from all the people I`ve met at the CRC and their amazing passion for showing and talking about their work, I was presented with the Thomson-Walker print collection; a group of 2500 prints collected by the surgeon Sir John William Thomson-Walker that were hinged or partially fixed on to poor quality backing boards. 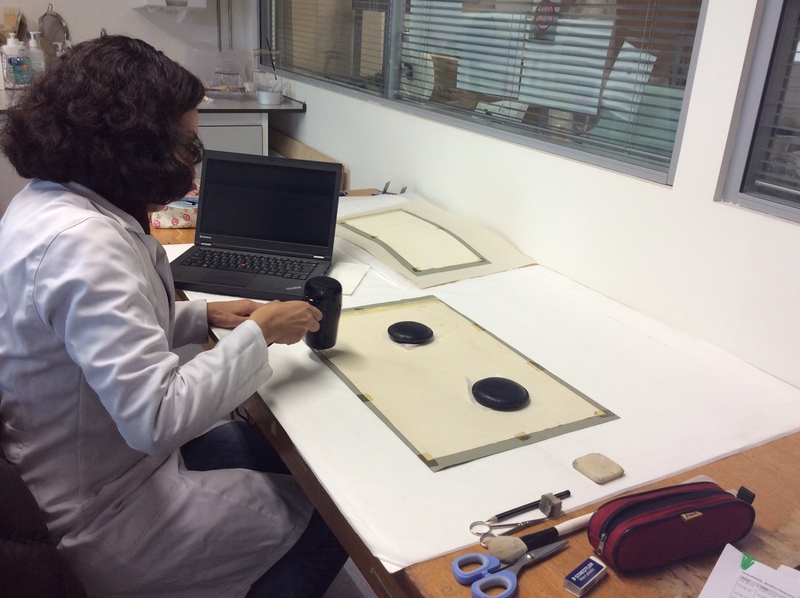 A brief condition report for each print was made before any conservation treatment was undertaken. Once the appropriate documentation had been completed, the hinges could be cut using a scalpel separating the prints from boards.The prints were then cleaned using chemical sponge, carefully removing any debris and dirt. Surface cleaning is an important conservation procedure not only for aesthetic reasons but also to remove material that may cause abrasion, acidity and attract insects (e.g. food or mould residue). Once the prints were surface cleaned, the paper and adhesive used on the hinges could then be removed. Samantha Cawson – during her internship in the beginning of this year – started this project and tried different approaches to remove the adhesive from the prints. She observed that a carboxymethyl cellulose poultice, interlayered with tissue paper, would be most effective on the range of adhesives present in this collection. The poultice technique consists of applying a small amount of moisture on a specific area, in this case to soften the water based adhesive thus allowing the hinges to be removed with a metal spatula or a scalpel. For those prints that were glued directly onto a backing board, I was able to reduce the board to a fine layer using a scalpel. This allowed the poultice to be placed under light weight in the area where there was adhesive as before but for a few more minutes. So far, this has been my first two weeks at the conservation studio and I`m glad to say that the prints treated look much better. I`m very happy to have the opportunity to practice and improve my skills at the CRC and observe the distinct answers to the treatment on varied medias and supports. I`m excited about the upcoming projects that I will work on during my stay as well as the chance to see some of the the amazing work develop in the conservation studio. This entry was posted in Uncategorized by conservation. Bookmark the permalink.